Apparently deer heads and antlers are here to say with holiday decor. I'm liking the trend but we're not really the rustic, hunter, deer-head-wall-hanging kind of people so I haven't been able to commit to one. Even if it's hairless, gold, and super cute from Target. Anyone else feel the same way?! 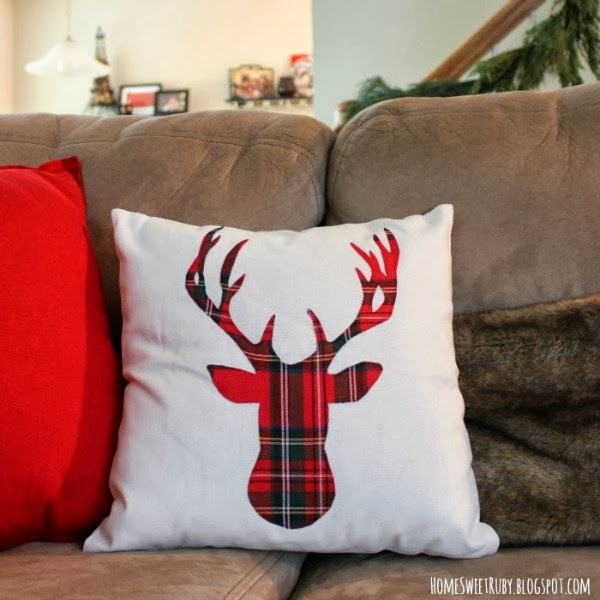 But I do love festive pillows because I think they are the easiest, low cost way to dress up a room for the holidays. Below is a prettier view of the pillow in our new home, after I learned how to use my big girl camera. So much better. ha! First, print out your stencil on cardstock paper. If it's larger than a regular piece of paper like mine, just print it out in several parts, tape it together, then cut it out. 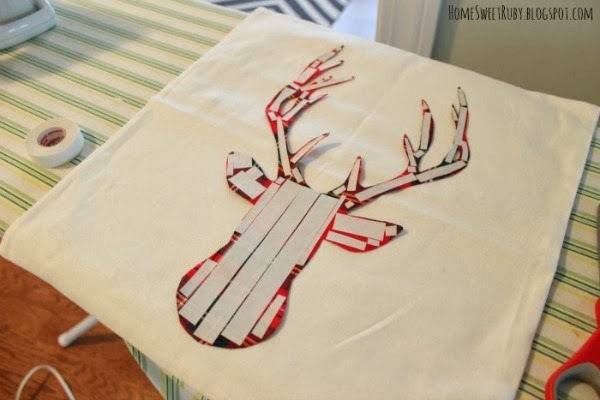 Pin the stencil to your fabric and cut the shape. You could also trace it with chalk before cutting, which I think would have been easier. I wasn't anticipating using Mod Podge, but since my fabric is a thin tablecloth, the edges were fraying. I used a small sponge brush to apply Mod Podge on all of the edges, particularly on the antlers. If you have a thicker fabric you probably won't need to do this step! After it dried, I trimmed the frays and ironed it very lightly to keep it flat. The most tedious part of this project is applying the Heat n Bond strips. I followed the instructions on the package. I probably overdid it quite a bit, but I wanted to make sure none of the antlers started pulling up with a husband and dog who tend to be rough with these types of things. 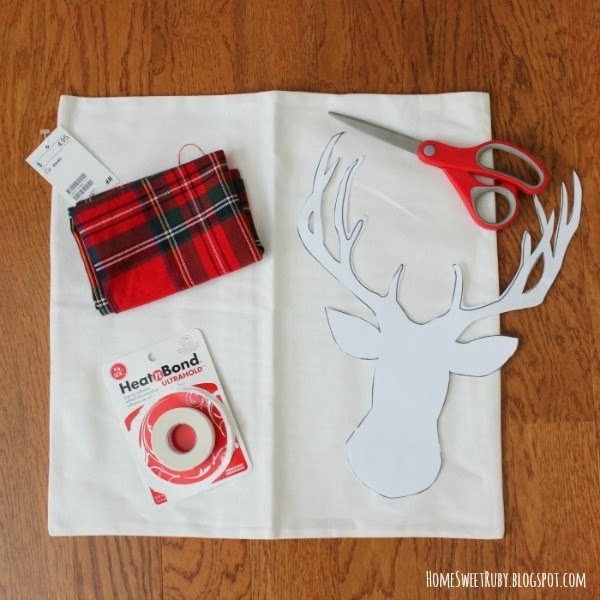 EDIT: I've been told by an awesome reader that you can actually buy Heat n Bond by the yard at your local craft store, which means you can trace it the same way you did with the plaid fabric and apply in one piece! I haven't done it myself but that sounds like a good option here, unless you already have the strips like I did and don't feel like buying more. After ironing the strips onto the plaid fabric, I removed the paper and flipped it over. 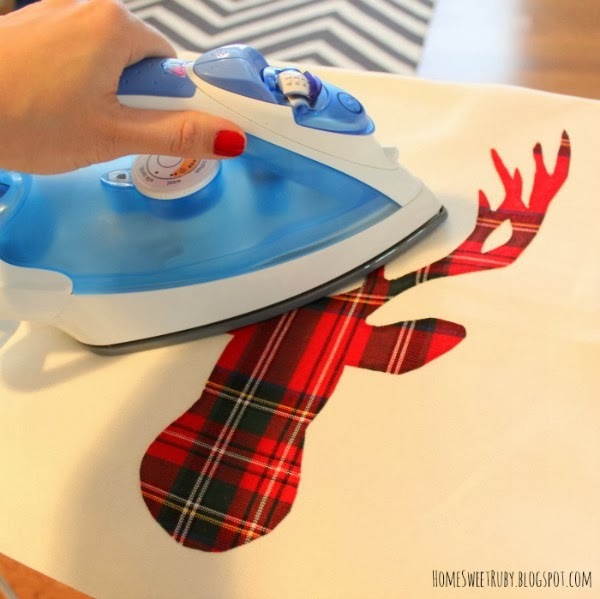 Make sure to center it because this stuff will hold the moment your iron touches it! I ironed the front for 10 seconds, flipped it over and ironed the back for 5, then let it cool before stuffing it. That's it!! Want more holiday projects? Check out my gold leaf Christmas print here! This is such a GREAT idea!! I am loving it & also how easy it was to make! The hubby is a huge hunter so he would love something like this around the house! Thanks for sharing! Wow! What a cute pillow! You made that so much easier than I thought! Thank you so much!! It would look so great with other colors and fabric, let me know how it comes out! Now that is INCREDIBLE! Love it! Mr. Redneck would actually like that pillow in our home. Thank you Courtney!! My husband isn't into hunting and he actually really liked it. Sounds like it will be perfect in your home too! Very cute! 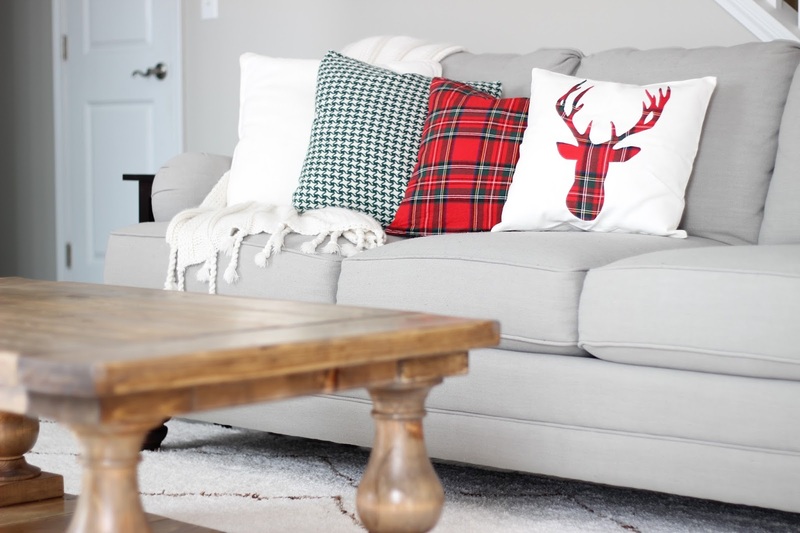 I have been looking for some plaid pillows that are an reasonable price and I'm striking out. This is a fun alternative! Thank you! I bought a table cloth from Home Goods for $10 and made a table runner, pillow, and now this out of it. There is still a bunch of fabric to spare too, so maybe you can do something similar! Uhhhh freaking fabulous! Love love love! That is really cute. Love the plaid. I love that this is no sew! Awesome! I want to try this - you can make them for all seasons! This is adorable! I love the plaid fabric you used, and obviously that it is a no sew project. I looove deer, so this is perfect! I'm definitely going to have to do this! SO CUTE! Thanks for sharing! 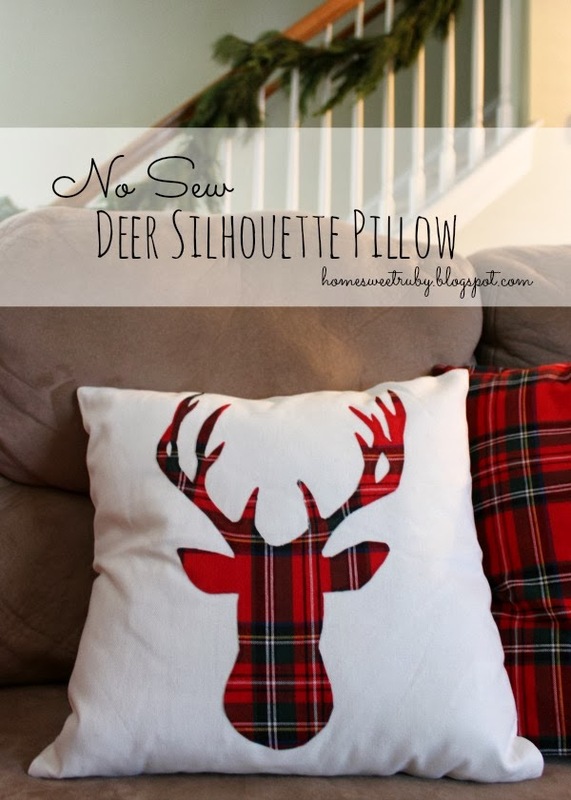 Great pillow & so time appropriate (almost), I will definitely be making a couple of these. Thank you ever so much for sharing your talent--you generosity is appreciated. Thank you!! SO glad to hear you like it! Just a thought, you can buy Heat n Bond as a sheet. Just fuse to the wing side of the fabric. Then draw/trace reindeer in paper side. Cut out and then fuse to the pillow. Just quicker than having to piece the skinny kind. Such a cute and festive idea! This is adorable! Just curious if you provide a link to the deer silhouette? I'm also looking for the deer hear silhouette. I printed it last year but need to re-do with better fabric. Hi!! I shared a link in the comment above and edited the post to include it as well :) So glad to hear you are loving this project! !